The tank’s dimensions are 72w X 30h X 90d. It is constructed entirely ( top, bottom, and sides) of 1” thick clear acrylic, with the exception of the sides which are 1” thick black acrylic. The side panels are constructed from black acrylic to visually minimize this area and to eliminate the reflection properties of clear acrylic. The rear panel is made from clear acrylic to facilitate its cleaning since a clean rear panel was a prerequisite for achieving the illusion of infinite depth. 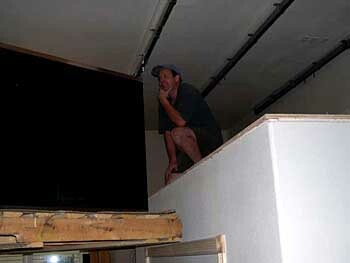 There is a removable, external ¼” black acrylic panel that covers the back wall of the tank. This false background panel can easily be removed to allow inspection and cleaning, which would otherwise be impossible with a solid black panel. The tank’s four top openings each have a dimension of 27” X 36”. There are two 10” X 12” overflows, one in each rear corner, with black acrylic covers to reduce algae growth inside of the overflow box. 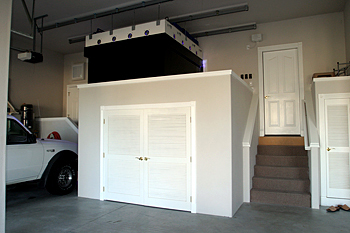 Since the display tank is viewed from a den inside the house, and since the garage where the tank is located is 4 feet lower than the den, the tank sits on the stand 7 feet above the garage floor. 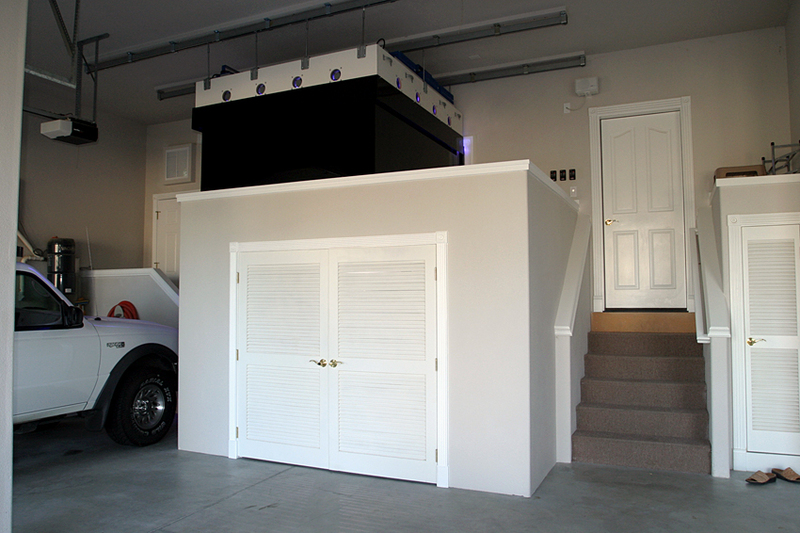 This geometry provided a great opportunity to create a room underneath the tank and have enough space for all the equipment, yet avoid taking up valuable garage space. The stand is constructed from wood, drywall, and Formica. It is framed as you would frame a house. 2 X 6 framed walls, sheeted on both sides with ¾” plywood, and coupled with two large 6 X 18 laminated beams support the 2 X 12 floor joists underneath the tank. The stand was over-sized to allow a person to stand alongside the display tank comfortably. It’s this feature that enables easy access to every inch of the display tank. I just slide the suspended light hood away from of the tank, bend over the top, and access anywhere in the tank by hand. The top of the stand was laminated with Formica to provide a long-lasting, cleanable surface.